Dumfries is the biggest town in southwest Scotland, so it has plenty of places to have a hog roast. Many of them are made of the characteristic red stone that features in the area, like The Robert the Bruce, a former bank with impressive classical columns. It overlooks the spot where Robert the Bruce killed his rival for the Scottish throne, John III Comyn “the Red Comyn” in 1306. Here at Hog Roast Dumfries we love catering for pubs, and the grander the better. 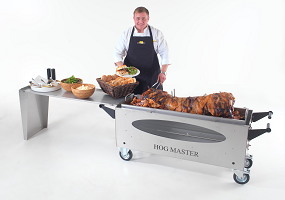 Although our methods are modern, stainless steel and gas burners rather than a spit over an open flame, hog roasting is a time-honoured method of cooking. There’s nothing like setting up our machine in the beer garden of an old red brick or timbered building, seeing the history in the stones as the air fills with the smell of meat roasting slowly. It’s a fantastic accompaniment to the match, and good company. A hog roast is our most popular choice, at its simplest level we offer a hog roast sandwich, freshly carved pork in a soft white bap with apple sauce and stuffing. We also offer other choices of meat, such as spit roasted lamb or chicken, each with their own accompaniments. Potatoes and salads are optional sides, or for the real wow-factor we can do a formal meal complete with a choice of canapés and desserts. We also provide waiting staff and proper crockery and silverware, meaning a hog roast can be a wedding dinner that really packs a punch. All you have to do is bring the cake! Like many other towns, Dumfries has a long history as a market town. It’s thought the tradition started here as far back as 1188, and although it fell out of fashion for a while it was revived in 1999. These days the market runs every Saturday and includes a traditional butcher and stalls selling fruit and vegetables, and other local produce. In fact the people here are so proud of their food, and it even has a “designated food village” in Castle Douglas, which has around 50 independent shops producing and selling Scottish food and drink. With everything from eggs, bread and cheese, to organic meat and fish, it’s almost like a market itself. This kind of love of food is important to us, because we keep our services locally focussed. Pride in local food marries up well with a spit roast because it shows off fresh local meat to its best. Since our machines are glass fronted, our customers can see the meat roast slowly in its own juices. And because the cooking takes several hours and no fat is added, which makes it amazingly tender and healthy. It’s the perfect treat for these health-conscious times. There’s nothing that can beat the taste of good food cooked simply, something that the food culture of Dumfries shows the people here know so well.